The weather in Vancouver is dreadful between the months of November to March. As a result many of the street food carts go on hiatus during this time, since no one wants to wait for their food in the bone chilling rain. However once the cherry blossoms and tourists appear with the warmer weather of April, the transient food sellers return. 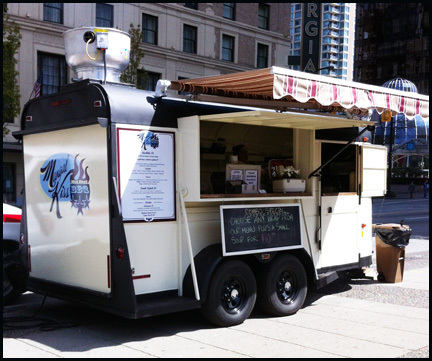 In the case of Mangal Kiss, they went through a metamorphosis during their absence and returned to the street with a newly painted food cart. Bye-bye tin can, hello larger cart with a snazzy awning and a new beige colour scheme. I dearly missed Mangal Kiss during the winter months. I feel their wraps represent what a lot of Vancouverites are looking for in good food: fresh and healthy ingredients prepared in a tasty manner. Although they do a great job of grilling their meats, the highlights of their wraps are all the veggies they load into the wrap. It’s like a salad you can hold in your hand and feel good about for making such a healthy but yummy lunch choice. It seems I was not alone in appreciating the food from this cart on Georgia Street. There was a queue of people waiting for their order when I arrived and they had sold out many of menu items. Fortunately for me, they still had their lamb kebab wrap available, which is my favorite. All the wraps use the Persian bread called Taftoon (a seasoned flour leaven bread that is traditionally cooked in a clay oven). It’s somewhat similar to pita bread but softer and hefty enough to hold all the ingredients in. 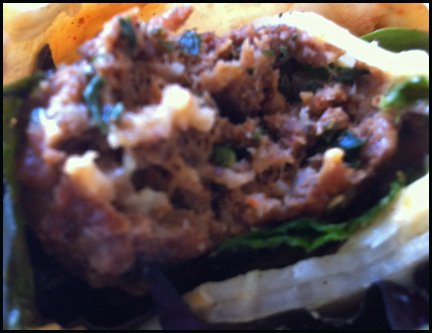 The lamb kebab was made with lamb, onion and parsley. The kebabs were placed on the grill only when ordered, had a distinct lamb flavour, were seasoned well and had a slight spicy kick. In addition to the lamb that was prepared expertly, the wrap comes with a large volume of fresh and diverse array of tasty vegetables. No iceberg lettuce here. For the lamb wrap, there is thinly sliced radishes & cucumbers, gourmet salad greens, tabbouleh, hummus and a tangy white dressing. On a second visit I wanted to have their chicken wrap, which comes with different ingredients for the wrap. However, they had already sold out of the chicken skewers and they ran out of the Taftoon bread. Instead, they offered me a Beef platter, which consisted of all the ingredients of the chicken/beef wrap but served like a salad instead. In the end, it worked out for me because it allowed me to photograph all the fresh vegetarian ingredients in a neater fashion. 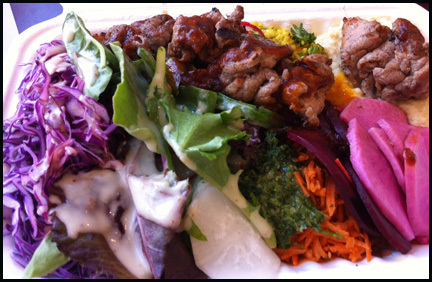 When I open the take out container, the platter was visual stunning with vibrant colours and it stimulated the appetite. There was shredded purple cabbage, beets, pickled turnips, cucumbers, radish, spiced Moroccan carrots, gourmet salad greens tabbouleh, couscous, and hummus. There were also 3 sauces: a tangy white dressing, an orange sauce that was sweet and spicy and lastly a BBQ sauce that was savory and spicy. With exception of the gourmet greens, all these ingredients can be found in the beef/chicken wrap. The beef was tender, prepared medium well and delicious. However all the vegetables were the star of the meal. 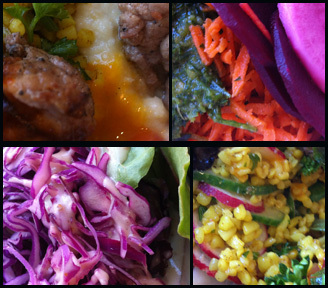 They were fresh and provided different tastes, like sweet, sour & spicy, and textures. Although I enjoyed the platter, I would have preferred the wrap, as more flavours and texture would have merged together in one bite. The only issue I have with Mangal Kiss is that it’s not a grab and dash type of lunch since they only grill your meat when you order it. However good things take time to make. I feel the food served by this cart is full of flavour and very healthy (you definitely get at least 2 servings of your daily intake of vegetables).